You might be surprised as to how many people have been visiting the food shelves because they are hungry. This includes working families, children, seniors, and students. 1 in 8 children in America lives at risk of hunger and 1 in 11 households in Minnesota is affected by hunger. We can join hands to help some of these people and we have been for the past few years. Sagitec has been participating in the annual food drive where all donations go to Second Harvest Heartland. Second Harvest Heartland works closely with nearly 1,000 partnering food shelves, food pantries, and other meal programs. 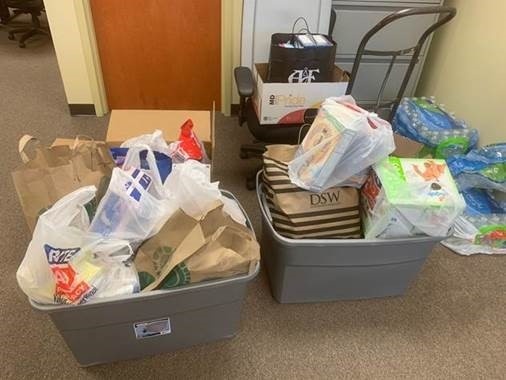 Sagitec donated 456 pounds of food last year and this year our offices conducted a food drive for 1.5 months with a company goal of collecting 500 pounds of food. In our Minnesota offices, to make this drive even more fun, we had a competition for the heaviest box of food. The winning office donated 330 pounds of food. Overall, the Minnesota offices were able to collect and donate over 622 pounds of food. Our Maryland and West Virginia consortium project competed on a donation percentage - a total number of team members divided by the number pounds of food donated and the winner was ‘Team Incredibles’ with 50.2 pounds of food and a donation percentage of 17.9%. A total of 234 pounds were collected, putting the company total to over 800 pounds! It is time we all join hands to end food insecurity and prevent people having to make choices between buying food and medical bills, food and transportation and/or food and rent.